Unilog’s 2019 EVOLVE eCommerce conference will mark an important milestone for the company – not only is it their fifth annual meeting for customers, the interactive format and high-profile speakers are going to shake up the conventional meeting experience as you know it. Slated for April 9-12 in New Orleans, EVOLVE 2019 is guaranteed to challenge attendees’ thinking and expand their digital tool set. 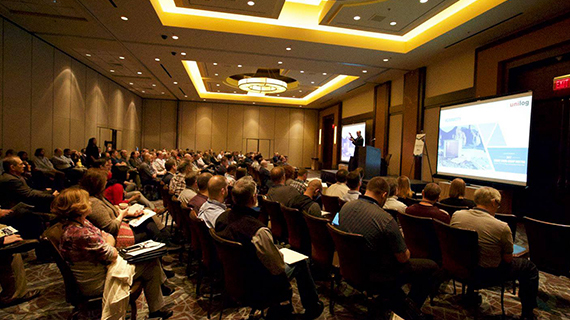 In order to accommodate the long list of industry speakers, hands-on training sessions, and customer-led panel discussions, this year’s conference has been extended by a day. “We’ve raised the bar for our 2019 user conference to make this a premier eCommerce event for our customers,” said Unilog CEO Suchit Bachalli. EVOLVE 2019 will be more interactive than ever with multiple panel discussions, Q&A sessions, and other opportunities to network with people they wouldn’t normally have access to on the regular meeting circuit. In addition, Unilog is excited to announce several sponsors who are helping to support this year’s event, including Google, Affiliated Distributors (AD), IDEA, and Orgill. While some attendee favorites will be back to share their expertise, Unilog is augmenting sessions this year by adding many new faces with specialized backgrounds in the digital commerce space. Among them are two keynote speakers: Technology Futurist Jack Shaw and Forrester VP and Principal Analyst Frank Gillett. Shaw has been predicting the future of technology for more than 30 years. In addition to helping businesses understand the impact of emerging technologies, he is a leading authority on blockchain technology, artificial intelligence, and Internet of Things. Voted one of the top five technology futurists, Shaw is also a best-selling author and advisor to many Fortune 500 companies. As a Forrester vice president and principal analyst serving CIO professionals, Gillett predicts and advises on the disruption and business impact of the Internet of Things and other emerging trends and technologies. He routinely works with CIOs, CTOs, strategists, and marketing execs across many industries, including high tech, automotive, and manufacturing. In between sessions, attendees will have another chance to check out the TechZone, where businesses will showcase their services and latest technologies to help companies improve the digital commerce experience. This is also the place to provide product feedback, take the new CIMM2 UI for a spin, or get one-on-one help from a Unilog expert. As part of the EVOLVE conference experience this year, Unilog is proud to host a Build-a-Wheelchair® charitable team building event. Attendees will have the opportunity to donate two hours of their time at the conference to building new wheelchairs, which we will donate to a local disabled veterans group in New Orleans. Unilog will cover all costs of the materials and the event. All you have to do is show up and participate. We take corporate social responsibility seriously and are proud to give back to those in need. Early bird registration is open now through January 18, 2019, so register soon to lock in a great rate before prices increase. More information and registration.